Let us consider more of the teachings of Sha’ul on HAMASHIACH in Chapter 3. את eth Set your affection on things above, not on things on the earth. 3 For ye are dead, and your life is hid with HAMASHIACH in YAHUAH. Here is a another instruction to set your affection – set your likes – on things above, the residencies of the conditions of the soul, and the radiances of the body of HAMASHIACH, for the instruction delineates clearly between the soul which is to rise and the flesh which is already dead. But what is this statement that your life is hid with HAMASHIACH in YAHUAH? What is this, if it is not the incorporation of your singular soul within the Guph (the body) of HAMASHICH, which is within YAHUAH? We could speak here of the both the physics of light – that all of existence is merely the division of the immense power of the darkness by the eternal light, the Or Ayn Soph, which is the light of the world, the Or Ha’aretz; and the metaphysics of light – that the light shines through the darkness, but the darkness does not comprehend it. Consider that the orchestration of life in the flesh is the orchestration of darkness in a temporal condition that is outside of the light of the world. The orchestration and displacement of the darkness – the machinations of the flesh have no eternal existence, but are subject to the laws of entropy. The orchestration and displacement of light, however, given that all light is derived from the Or Ayn Soph (which is MASHIACH glorified with the Father from the foundation of the world), is eternal. The construct that HAMASHIACH is in YAHUAH, is another issue altogether. YAHUAH is not easily understood, for YAH in the infinite is not knowable, seeable, nameable, or understandable – yet YAH in the finite, who is YAHUAH YAHUSHA, is knowable, seeable, nameable and understandable – Yishmaeni Elohai! Therefore I will look unto YAHUAH; I will wait for the ELOHIYM of my salvation (yesha): my ELOHIYM will hear me. Again, we find that the discussion in Qolasiym is primarily metaphysical. It is therefore impossible to carefully understand this writing without entering into an understanding of the mysteries – which we are called to know by MASHIACH. When HAMASHIACH, who is our life, shall appear, then shall ye also appear with him in glory. Here is an interesting set of principles, is it not? We have a prophetic declaration that HAMASHIACH, having risen at the time of the writing of this discourse, will appear anew. This idea of two appearances first appears in Bere’shiyth 1:1, where seven words are set forth, the fourth and the sixth of which are the word eth (את). However, the second one is slightly different as it is and eth (v’eth) which is spelled (ואת). 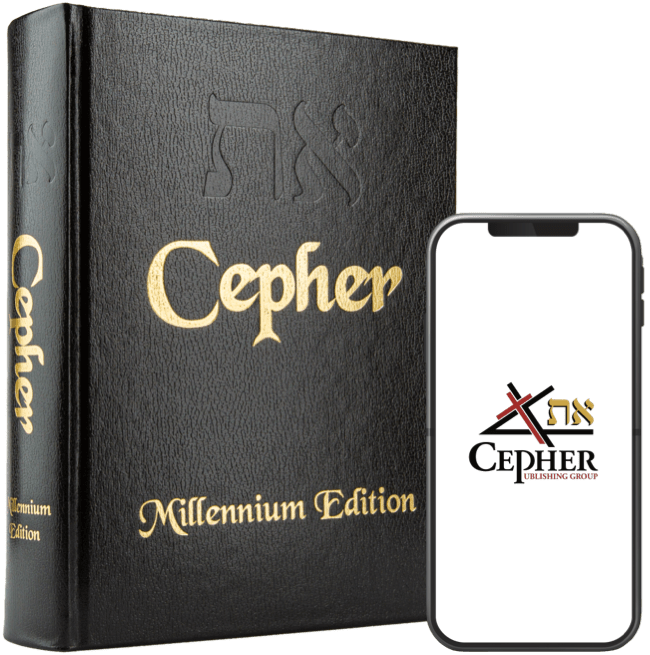 We have suffered much criticism over the inclusion of the word eth (את) within the Eth Cepher, but we find its meaning to be so incredibly important. The aleph (א) is the symbol of the eternal YAH (YAH in the infinite, divided by the nail, from the reflection of YAH in the finite, which is MASHIACH); the Tav is the mark of salvation: found on the forehead of Cayin, struck over the doorposts in Mitzrayim when the spirit of death passed over the houses marked with the blood of the lamb, and marked by the angel with the inkhorn. YAH proclaims “I am the aleph and the tav” four times in Chizayon. We then see the first appearance of the eth in the fourth position of these first seven words in Bere’shiyth, and the second appearance in the sixth position of this phrase. There is a difference, however, between the two, because in the second iteration, the aleph tav is accompanied with the letter vav (ו) – the nail. The second appearance is as the nailed MASHIACH.